Fastest Bitcoin Generator Review – Bona Fide Bitcoin Scam! An investment through FastestBitcoinGenerator.com is perhaps the quickest way to deplete your Bitcoin wallet. Pulling out all the tricks in the book, the Fastest Bitcoin Generator is a deceptively crafted scam built upon fabricated testimonials and web elements. As you will learn throughout the duration of this indisputable review, the Fastest Bitcoin Generator is a cancerous Bitcoin investing hoax that should be blacklisted and eradicated from existence. What is Fastest Bitcoin Generator? The Fastest Bitcoin Generator is a Bitcoin mining software that automatically generates encrypted codes through “intelligent algorithms.” Created by their team of ethical hackers, the Fastest Bitcoin Generator claims to create bitcoins in a method never procured before. According to FastestBitcoinGenerator.com, this Bitcoin mining software is capable of mining up to 1 BTC per day, which is not only outlandish but not plausible given their mining infrastructure. How does Fastest Bitcoin Generator Work? Like most scam operations, the creators behind Fastest Bitcoin Generator made it as simplistic and enticing as possible for prospective investors to get started with their system. A minimum Bitcoin deposit equating to a value of $200 is required from the start to verify that you are a “serious” Bitcoin investor. 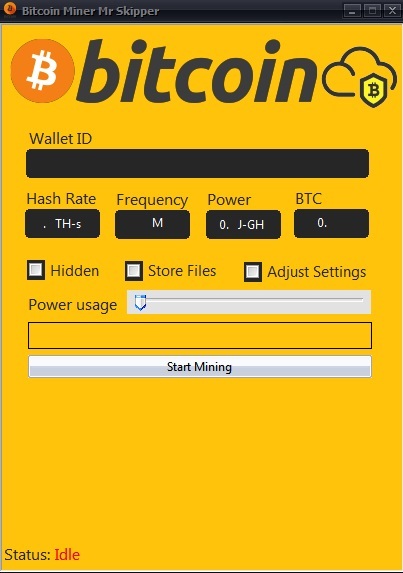 After your purchase, you are able to download the Fastest Bitcoin Generator software to your computer where you will then be enabled the ability to mine copious bitcoins on a daily basis. Operating this magical mining software requires users to fulfill a few parameters before the accruement of bitcoins can begin. Investors must specify their desired hash rate, frequency rate along with power efficiency. Then you must select the amount of bitcoins you wish to generate, select your power usage then click on “Start Mining.” While the site will feature numerous testimonial videos regarding the operational aspect of the Fastest Bitcoin Generator, we believe them to be as reliable as their fictitious user testimonials provided below. Apart from the obvious outlandish claims of being able to generate 1 BTC every day, perhaps the most disturbing red flag found at FastestBitcoinGenerator.com would be their application of fake user testimonials. Found towards the bottom of the home page, countless “user testimonials” can be found but not one of them is real. Research has shown that most of the testimonials found come from profiles found on LinkedIn, where the creators behind Fastest Bitcoin Generator kept most of their first names but created a new surname. A Bitcoin per day is as unrealistic as it gets in the cryptocurrency domain. Especially considering how the software only costs 0.018 BTC, if this software was legitimate and able to generate the type of returns advertised then it would be valued at a much higher price than 0.018 BTC. No information pertaining to the owners or creators are provided on the site. A contact submission form along with the email address [email protected] are provided on their Contact page. 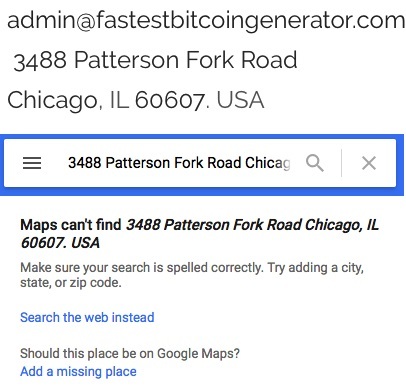 The physical address found on the FastestBitcoinGenerator.com contact page would be 3488 Patterson Fork Road, Chicago, IL 60607. What we find peculiar in regards to this alleged office address though would be how it appears not to be an authentic address according to Google Maps. 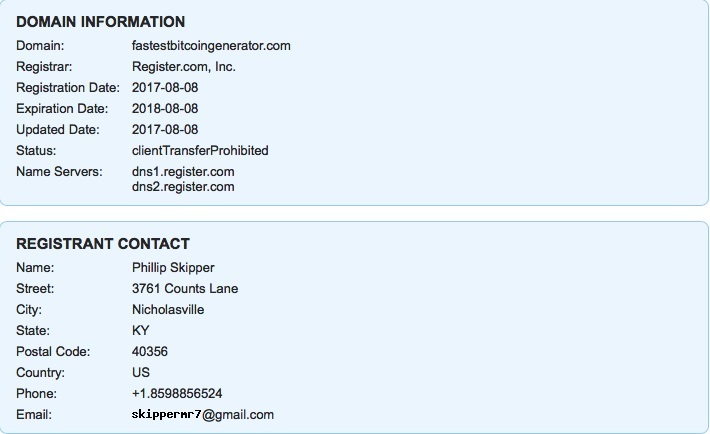 The address that appears on whois.com is also fake, by the way. FastestBitcoinGenerator.com has a SimiliarWeb global rank of 5,930,885 as of November 29th, 2017. While the site receives minimum quantities of traffic, it appears that nearly 48% of the sites traffic is generated from YouTube, where phony review videos can be found endorsing this scam operation. The Fastest Bitcoin Generator exploits one of the oldest ideologies in the book, which would be creating the illusion that you can quickly accrue riches through minimum effort. As many highly successful individuals will proclaim, nothing worthwhile resulted from the output of minimum effort. The same can be said in regards to the Fastest Bitcoin Generator software, that nothing worthwhile will come from the application of this deceptive Bitcoin mining program. The employment of fictitious user testimonials combined with unrealistic ROIs should provide any investor with enough evidence to conclude that the Fastest Bitcoin Generator is not trustworthy. Our two cents on the matter would be to hold onto your bitcoins and let them accrue value on their own or browse legitimate alternatives like the ones found at our Bitcoin Investment Guide. Review Verdict: Fastest Bitcoin Generator is a SCAM! Not sure which cryptocurrency mining sites are legit? Learn and equip yourself with the most prominent and trustworthy operations by reading our comprehensive Cryptocurrency Mining Guide! Have your suffered losses to the Fastest Bitcoin Generator? Please share any experience or knowledge you may possess by leaving your feedback below!